This Caterpillar starts of as one of a row of eggs. The eggs are oval, and have a diameter of about 0.5 mm. The eggs are white or pale green. The young caterpillars are yellow and have stiff hairs all over. 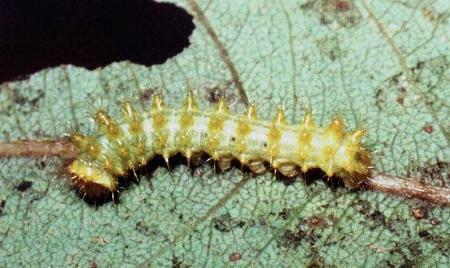 Later instars become olive green with tubercles (scoli) each of which has a cluster of short stiff hairs. 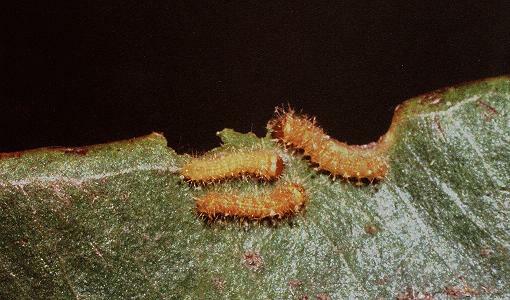 The scoli are also green except in the 3rd instar, in which they become red. various types of Citrus: e.g. Lemon, Orange, ( RUTACEAE ). 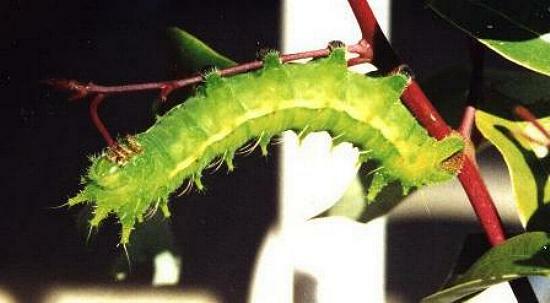 The caterpillars can grow to a length of about 10 cms. 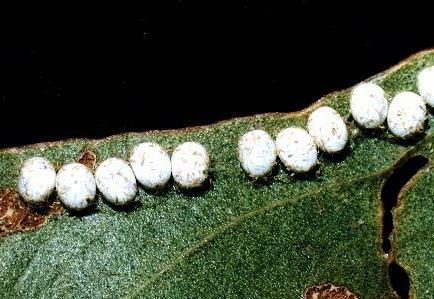 The caterpillar pupates in a stiff oval cocoon on the food plant or nearby structure. There is a considerable variation in the coloration of adults of this species. 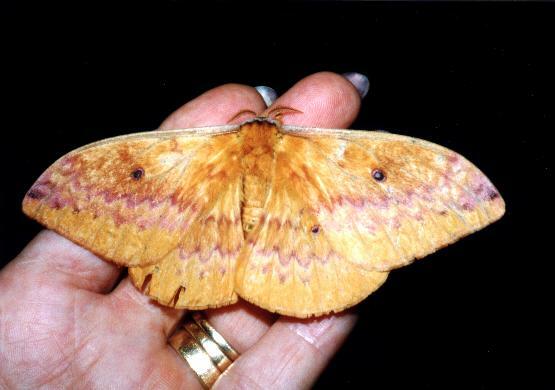 The basic adult moth is yellow with two zig-zag brown or pink lines across each wing. 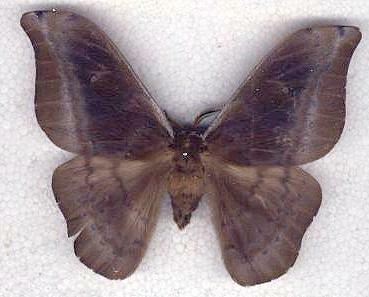 The forewings each have a small transparent dot in the middle. The males have hooked tips to the forewings. In this way they differ from those of the related species Syntherata escarlata. However, the wings often have grey areas, which may extend across the whole of the upper surface of the wings. 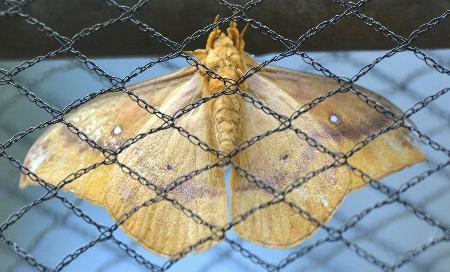 The moth typically has a wingspan of 14 cms. New South Wales, as far south as Newcastle. 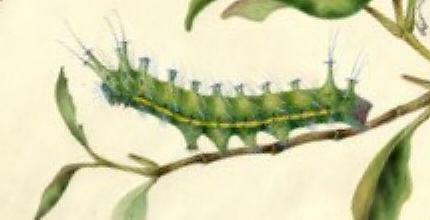 A picture of this caterpillar appears in a book of paintings on Moths and Butterflies by Helena and Harriet Scott - paintings done around 1850s-1860s while living on Ash Island in the Hunter estuary. 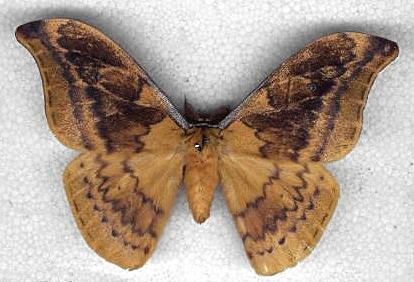 There it is under its older name Antheraea janetta. Melbourne University Press, 1990, pls. 15.5, 15.7, 28.14, pp. 406-407. Butterfly and Other Invertebrates Club Inc..
LeapFrogOz, Kuranda, 2008, pp. i, 10, 34. LeapFrogOz, Kuranda, 2015, p. 194. Volume 12 (1843), pp. 344-345, No. 8. CSIRO Publishing, 2007, pp. 6, 162.